Secretary of State John Kerry on Wednesday called National Security Agency leaker Edward Snowden a fugitive and challenged him to "man up and come back to the United States." Snowden says in an interview that he would like to go home. The former NSA contract systems analyst is living in Russia on a temporary grant of asylum after leaking a massive volume of NSA documents to the media. He told anchorman Brian Williams of NBC News that he had taken action in the belief that he was serving his country in exposing the surveillance programs of the NSA. "I don't think there's ever been any question that I'd like to go home," Snowden said in a segment of the interview broadcast Wednesday night. "Now, whether amnesty or clemency ever becomes a possibility is not for me to say. That's a debate for the public and the government to decide. But, if I could go anywhere in the world, that place would be home." 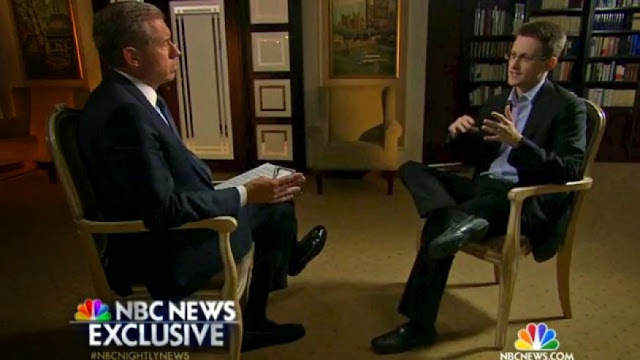 Kerry's comments came before NBC aired that portion of the Snowden interview. On the matter of Snowden returning, Kerry told NBC's "Today" show: "If Mr. Snowden wants to come back to the United States, we'll have him on a flight today." Kerry also said, "A patriot would not run away." Snowden told Williams that he worked undercover and overseas for the CIA and the NSA. He said he had a much larger role in U.S. intelligence than the government has acknowledged. "I was trained as a spy in sort of the traditional sense of the word, in that I lived and worked undercover overseas," he said. National security adviser Susan Rice said in a CNN interview that Snowden never worked undercover. As far as the necessity for the leaks, "let him come back and make his case," Kerry said. "If he cares so much about America and he believes in America, he should trust the American system of justice." Snowden said he never intended to be holed up in Russia but was forced to go there because Washington decided to "revoke my passport." In response, Kerry said: "Well, for a supposedly smart guy, that's a pretty dumb answer, after all." "I think he's confused," Kerry said. "I think it's very sad. But this is a man who has done great damage to his country."